Above : Callum's cheap karrimats finally arrived from Ebay, but they were not exactly what he'd expected. Just as the site looked to be drying out nicely, a few days of predictably wet weather took things back a few steps. 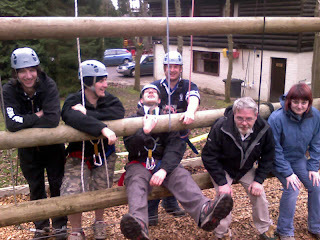 Nevertheless there was a good turnout of campers - mostly local, from Dunfermline, Dalgety Bay, Rosyth and Perth. One of the worst-hit areas of the site in terms of wetness has always been the outdoor archery range at the back of the Henderson building. The heavy rain and constant use over the last month had left the ground in a bit of a state, making decent boots an essential addition to the archery kitlist for participants. Above : Murray and his band of little yellow helpers expertly move the mats to the archery range. While tidying up part of the tractor compound, Bob had a 'lightbulb moment' (energy-saving of course) and thought of a good plan to solve three problems at once. 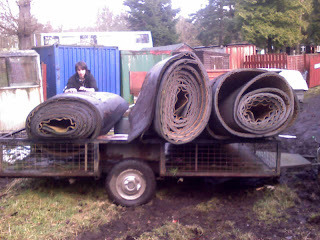 A number of rolls of old carpeted judo-style mats had been lying in the compound for a while after being moved from the wet weather hall - and were no longer suitable for indoor use. Problem one (what to do with them) was quickly solved by moving them onto a trailer and taking them up to the archery range to provide a decent dry surface, thereby solving problem two (muddy range). 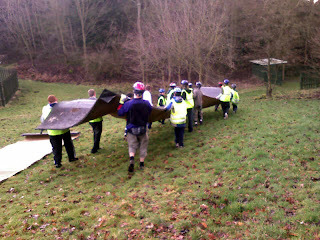 Problem three had been to find a suitable small service project for local leader Murray and his band of merry scouts, who were keen to help during their stay on site. After taking the trailer up to the archery range, the Fordell staff were able to sit back while the little taskforce expertly carpeted the range. The new flooring will be thoroughly tested in coming weekends but appears to be doing the job and stopping the ground becoming too wet. 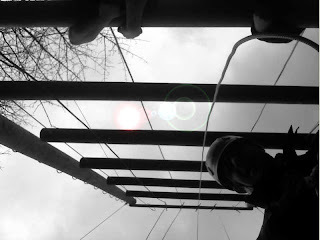 Above : Jacob's ladder training session. 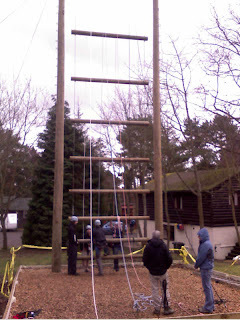 Sunday afternoon saw a staff training session for the new(ish) Jabob's ladder, in preparation for the annual roped activities assessments which are carried out by the site's technical adviser soon. Despite a few initial problems setting the ropes up, which resulted in Rory having to climb the entire ladder to rethread one of the pulleys, the session went well. Above : Cameraman manages to take photo of person who tripped him up. By mid-afternoon, all the groups had left the site, and the final car was departing for home...unfortunately the leader having forgotten to remove the box from his roof first (see photo). Luckily some of the eagle-eyed staff (who weren't too busy taking photographs of it) stopped him and pointed out the error, although it's unlikely he would have made it to the main road with it still on top given the size of the speedbumps. 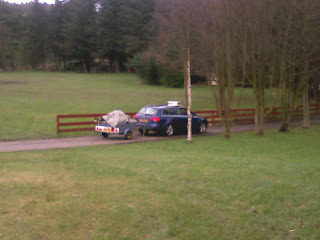 Above : Camping tips #53 - "Always remember to check you haven't left anything on your roof before driving home"